More and more homeowners are asking for dream dressing rooms rather than simple custom walk-in closets. Inspiration for these rooms comes from the constant bombardment by media — everything from celebrity interviews and home shows to social media like Pinterest, Instagram, Facebook and Houzz. Most people, however, don't have a celebrity pocket book to cover the cost of an extravagant dressing room and closet system. So how do we help these clients achieve the look they desire? By selecting different upgrades and special features that offer an instant "WOW" factor, but work within their concept and price range. Lighting‬ can have the most impact on a closet. Most of the hardware vendors are happy to work with your layout showing you what and where the lighting should be installed. 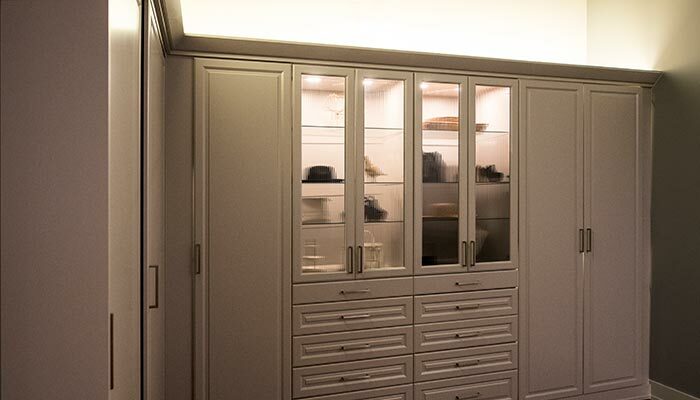 If a lighting system is not in the budget, then installing a few battery operated motion lights in select cabinets or drawers will still provide a high end look. ‎ Hardware‬ selections play an important part in the final look of the dressing room. It is the jewelry of the closet. Specialty handles and knobs can be featured throughout the room, or on select cabinetry for more impact. Trim not only adds to the beauty of a closet, but can also help with trouble areas or provide secret storage. Base molding dresses up any closet. By adding shoe molding to the base, it gives it a furniture look, while hiding the unevenness we often find along the floor. Instead of using larger expensive crown, adding a 3-4" fascia above the closet unit then attaching the smaller crown will hide the inconsistency in the ceiling height, while giving the impression of a large pricey crown. Hiding the transition seams with flat scribe molding completes the look. Fluted fillers throughout the room, or around specific feature cabinets will also add a high end look. Fillers that pull out and hide scarf or tie collections are always a fun surprise. Accessories are the toys of the closet. From baskets, to fabric bins and boxes many gadgets are available for any budget. Consider creating your own accessory zone, such as custom jewelry or tie cabinets. If you are creating it (or ordering it custom made), you can make it any size depending on the budget you are working with. The ultimate closet/dressing room can become a reality for every homeowner — even those on a budget. It only takes a little creativity, a mind for the details and knowledge of what is available at different price points. The experts at Closet Works are always happy to assist you in bringing your dream to reality. Closet Works has been crafting sanctuaries and creating a sense of order for Chicagoland homes for almost three decades. They are currently celebrating 29 years of creating custom storage solutions in the Chicagoland area and beyond. For more information on Closet Works call toll-free at 800-4-CLOSET (800-425-6738).